Read on the step-by-step guide on how to grow fenugreek from seeds in containers or ground at home, even indoors. Fenugreek leaves are very easy to grow in pots or ground at home. The fenugreek seeds can be used to make sprouts from seeds. Fenugreek (Trigonella Foenum-Graecum) is an annual growing herb native to the Mediterranean and Western Asia. Fenugreek leaves are not only very easy to grow from seeds in pots or ground at home, but also extremely beneficial herb. Fenugreek is known by various names like Methi, Greek Hay, Foenugreek, Fenigreek, Bird’s Foot, Hilba, Trigonella, Cow’s Horn, Goat’s Horn, etc. The fenugreek herb has various health benefits such as for lowering blood sugar levels. In India breastfeeding mothers are recommended to eat fenugreek as it has potential to increase milk production. Fenugreek can also control cholesterol, reduce menstrual cramps and benefit in digestive problems. The fenugreek herb has been used as a spice since ancient times in Asia and Europe is curries and pickles. The fresh fenugreek leaves (methi greens) are used in some Indian dishes and veggie curries and fenugreek seeds in curry powders. The leaves are also used in Thepla, which are very popular in Gujarati meals, and are used for regular meals, breakfast and during travelling. Fenugreek can be used as fenugreek sprouts, fenugreek powder, fenugreek tea or in oil form. Many people are recommended to take fenugreek supplement. The fenugreek leaves are dried and used in cooking as a spice. Fenugreek leaves dried are known as Kasuri Methi or kasoori methi. India is the largest grower of fenugreek. Fenugreek leaves have many health benefits. The fenugreek plant can grow to a height of 60 cm. 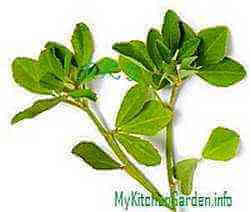 It has three-lobed triangular leaves (See the picture), hence the generic name trigonell. The plant produces yellow flowers which form beans containing fenugreek seeds. The fenugreek methi grows very quickly. Fenugreek (methi) grows well in spring to early autumn seasons, specially when the soil is warm. I have also grown it in winter in Sydney but the growth is slow. Fenugreek grows best when the temperature is between 10 to 30 °C (50 to 90 °F). In the areas of frost,fenugreek seeds may be started indoors 5 weeks prior to the last frost of the season. Fenugreek should be planted in full sun to part shade. Dig the ground to a depth of 25 cm and break big chunks of soil. Mix some river sand to make it free draining (vegetable garden soil). Mix lots of organic material like compost (composting guide) and aged manure to make the soil fertile. The fenugreek can be grown in any container or ground. The advantage of growing it in a pot is that it can be moved to indoors in the case of frost. If you gorw fenugreek herb in a pot, you can keep it indoors for ready use in kitchen. I grow in ground and in a rectangular Styrofoam fruit box of height about 10 inches. First you have to buy the fenugreek seeds. Indian grocery Stores keep both the fenugreek powder and seeds. To grow fenugreek plants, buy fenugreek seeds. The plant does not like to be transplanted after germination, so the fenugreek seeds should be sown at the final place. Or you can sow seeds (See picture) in biodegradable pots which can be put directly into the ground later on. Buy good quality seeds from garden shop or use the seeds from your previous crop. I, however, buy fenugreek seeds from Indian grocery shop, which grow well. In the areas of frost, it may be started indoors 5 weeks prior to the last frost of the season. The seedlings can be transplanted outdoors when the soil temperature is around 15°C (60°F). I sow seeds every 2-3 weeks in the season, so that when the first set of plants die, I am having the next set to get fresh green methi leaves. Keep the soil moist, but do not over-water. Feed the fenugreek plants with fish emulsion spray regularly. Fenugreek plants add nitrogen to the soil as broad beans do, so they are good to add nitrogen to the soil. Fenugreek leaves will be ready to harvest within 3-4 weeks after sowing the seeds. I just chop the fenugreek leaves from the top of the plants as and when I need it in the kitchen. This will encourage more growth and you will be able to harvest again fresh methi leaves after 2-3 weeks. The fenugreek plants will produce beans containing seeds. If you want to make fenugreek seeds, continue feeding and watering till the plants start to die. Collect the fenugreek seed pods and thresh them to extract the seeds. Leave the seeds in the sun to dry. Save the pods until you sow the seeds next time. Store the methi seeds in an air-tight container and keep in a dry and dark spot. Harvest fresh fenugreek leaves from your plants or buy from the market. Chop the leaves roughly and wrap in aluminium foil lightly. Make 2-3 such packets. Put the packets in a Ziplock bag and freeze it. When you want to use the fenugreek methi leaves, simply take out a packet, open it and wash and use. It is better not to wash the leaves before chopping to reduce moisture, otherwise the leaves will rot in the fridge. You may be wondering how to make fenugreek sprouts at home. Yes, it is simple. To make fenugreek sprouts, buy some fenugreek seeds from a grocery store. Put the seeds in a jar and cover with 3-4 inch of water above the seeds. Drain the water and cover seeds with a muslin cloth and leave in a dark place. The seeds will sprout in 2-3 days. Trigonella foenum-graecum information from NPGS/GRIN, www.ars-grin.gov. V. A. Parthasarathy, K. Kandinnan and V. Srinivasan (ed.). "Fenugreek". Organic Spices. New India Publishing Agencies. p. 694. Please tell me, can I grow methi in a small container like a fruit box? You can grow methi or fenugreek in any pot, small or large. You can place them in your kitchen window where it can receive sun light. cut off the leaves as and when required. How can I get regular fresh methi leaves in the season from my kitchen garden? Prepare two garden beds or containers for growing fenugreek. Sow seeds in one of the spots and after 3-4 weeks sow seeds in the second one. When the plants in the first spot begin to die, the methi will be ready to harvest in the second one. Keep on repeating this. When the fenugreek seeds germinate, white hairy thing will develop which will form a tony leaf. I planted my Fenugreek about 6 weeks ago, just harvested my first batch. A strong maple smell is in the air around my pots which is the smell I am familiar with. The Methi I buy in stores has the same aroma. However I cut out a large bunch of leaves to wash/dry, and they just have a strong earthy smell to them. No maple smell at all once they are out of the garden. I proceeded to dry them anyway and there was no change. What did I do wrong? Did I harvest too early? The typical methi flavour will come back when it is cooked. The best blog on kitchen gardening. Under sowing it is mentioned 5 cm deep, we presume 5 mm deep. Yes, the methi seeds should be sown 5 mm deep. Thanks. Fantastic! No words to express my gratitude for the knowledge that I have got here. My fenugreek plants soon develops beens, should I pluck them? You can use fenugreek leaves 2-3 times, after that the plant produce flowers and beans. You have to sow new seeds. However, you can mix the plants i the soil as they are the green manure, adding nutrients to the soil. Do I need to soak the seeds overnight before planting.the ordinary kitchen spice variety. How to get seeds from Fenugreek plants? It is not necessary to soak the fenugreek seeds before sowing. However, if you soak, the germination will take 1 day day less. You can use kitchen spice variety, you will see germination/sprouts in 4-5 days. Keep soil damp. To make seeds from the fenugreek plant, let the plant grow to flower and produce beans. Take out the seeds when the beans mature. It is better to buy fenugreek seeds from market. I tried to grow them indoor in a small wood container, only the stem grows fast, Leaves dont develop. I tried couple of times it is the same. I have tried my hands on different seeds, but result is same. This is surprising. It shouldn't have happened. When the seeds germinate, they produce 2 leaves. Next time try cutting the growing ends, and see the new growth should have leaves. I tried several times the germinate well n very soon they fall down and die seeds from different sources were tried but result is same I always kept them outdoors. The fenugreek plants should not die, keep the soil moist。The water should not stand on the soil for long, means the soil should be free draining. Minu, it may be due to inadequate watering, water the fenugreek plants daily. Add some cow manure to soil. can I grow crushed fenugreek? Crushed fenugreek seeds will not germinate, however, you can try if they are not finely crushed. I think you are doing fine. Do not water on the leaves. I hope you are not using only coconut fiber, you must use soil or potting mix and can add coconut fiber.